Do not miss it! 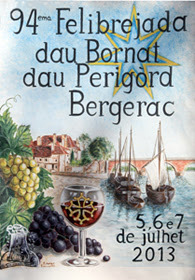 This year La Félibrée takes place in Bergerac, next time Bergerac will host this event will be in 2033 so do come along to my beautiful town and partake of the celebrations which will be starting on Friday 5th July. There will be singing competitions, traditional Occitan meal la Taulada, spectacles, parades, and a traditional ball. Hope you visit and have a great time!